I may keep this thread locked to keep it focused on info, and link to other threads for discussion. I encourage everyone to provide as much direct/original source info when they post news or links so that the community can judge the info first hand. These are used for showing off new game events and multiplayer with viewers. Major announcements are usually not included in the regular streams but there may be summaries of the week's news, and special streams for first looks at DLC. 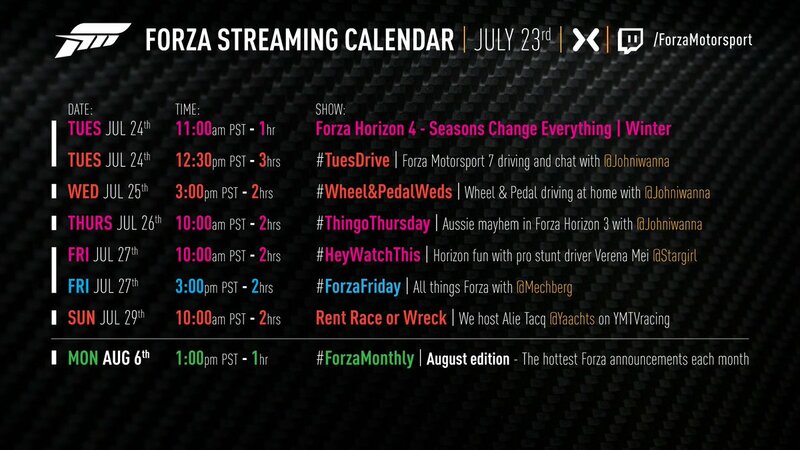 #ForzaMonthly is a special once-a-month livestream (anticipated on the first Monday of the month, subject to change) that does cover major announcements and a look ahead at features and content coming in the next month. See my www.bit.ly/ForzaCalendars at www.ManteoMax.com for articles, events, and rewards (both Horizon and Motorsport series, plus gaming Expos). My www.bit.ly/FH4spreadsheets linked there also has a tab compiling official news and press links for a running history of the game's development. See also http://www.kudosprime.com for a future visual online database of FH4 cars. July 19-22: FM7 had a presence at Comic-Con last year. Aug 21-25: Forza typically reveals more gameplay info at gamescom in Germany. Aug/Sep: Anticipate a Gone Gold announcement, Song list, Achievements list, possible Loyalty Rewards. September: a downloadable Demo is typically released a couple weeks before the game. September: a Launch Trailer is typically released. Sep 20-23: Ralph Fulton has given presentations at EGX in the past. September 28: FH4 Ultimate Edition owners get Early Access to the full game. October 2: FH4 Standard and Deluxe Edition launch worldwide. October 2: Car Pass begins weekly DLC car additions for 21 weeks. October: Anticipate weekly official Photo and Livery contests, and Forza Rewards. November: Forza games typically release a monthly content update with content and patches. December: Expansion 1 DLC has been announced for December 2018. Spring 2019: Expansion 2 DLC has been announced for the "First half of 2019." The community spotted around 90 cars from demo and media assets. Official announcements included release dates, pre-order bundle details, and DLC basics, and developers provided more information in interviews providing an overview of the game's features: In previous Horizon games you were a newcomer, champion, and manager of the summer Festival. In FH4 you're a resident of the year-round festival set in Britain (including Wales and Scotland). Part of this ongoing #HorizonLife experience is buying properties (which are used as Fast Travel and Forzavista/Upgrade points) from cottages to castles, taking on Jobs (such as a stunt driver for a tv show), and customizing your driver with clothing and emotes. You'll be able to earn Influence toward becoming a #HorizonSuperstar through racing (including Drag and Drift) but also through photography, Mixer streaming, painting, and other activities. Being there year round means you'll experience the four Seasons and changing environment which affect driving; frozen winter lakes and summer dry river beds open new driving locations, and muddy and icy terrain affect grip. Seasons cycle weekly for all FH4 players, though you can set your own time of day, season, and weather in Blueprint events, which includes a new Route Creator for P2P and circuit races. Though you have the option to play through the game in offline mode with Drivatar opponents, most will play through the game online on servers of 72 live players. Other player cars will be ghosted to prevent griefing collisions until you Co-op and Convoy with up to 6 players with the assistance of Quick Chat. Team Adventure provides 6 v. 6 ranked League competitions in playground game modes for Tag and Flag Rush. Showcase events put you up against special vehicle opponents such as motorcycles, hovercraft, and aircraft. Forzathon has been enhanced to become Forzathon Live, with hourly challenges and increased rewards when done with multiple players. Danger Sign jumps, Drift zones, Barn Finds, Auction House, and Storefront return. Other than the mention of new drift suspension, questions about car customization, a demo, and music channels were met with "stay tuned." - Details: over 450 cars from more than 100 licensed manufacturers, Ultimate Edition Early Access on September 28, worldwide release on October 2 included free with Xbox Game Pass, Play Anywhere, shared world Seasons, Route Creator, 60fps option on Xbox One X consoles, clothing options for driver personalization, own property in the game world, integrated Mixer broadcasting. - Details: discussion of Britain, Seasons, shared world, 60fps option, commitment to support the game after launch "for months and years to come"
Polygon interviews Jon Knoles on Britain's environments and elevation. The #ForzaHorizon4 team is excited to take part in the @MclarenAuto Global Test Drive event at Estoril Circuit in Portugal showing off the #E32018 demo to attendees and seeing more #McLarenSenna models in one place than ever before. It's a subtle thing, which we're dubbing "stream-to-win," and it sees Microsoft take its boldest step in battling the behemoth service Twitch. Horizon 4 will be the first Microsoft Studios game to recognize when players broadcast their live gameplay via Mixer and then give out bonuses within that game for doing so. In the week-plus since learning this about Horizon 4, we have been unable to find a comparable feature in any video game—meaning, one that recognizes a broadcast (on Mixer, Twitch, or any other service) and then gives out goodies inside the same video game as a reward. "The next episode of “Forza Monthly” will be broadcast on Monday, July 2, starting at 3 p.m. Pacific. In addition to talking about the recently wrapped Forza Racing Championship Series 1 Playoffs, we’ll be playing Forza Horizon 4 and answering viewer questions about Playground’s latest masterpiece, as well as showing off the July update for Forza Motorsport 7." "We’re proud to announce this week that Special Effect, a UK-based charity organization dedicated to helping people of all abilities enjoy gaming, has appointed our own studio head Alan Hartman as a Special Effect vice president. The Forza franchise has enjoyed a long relationship with Special Effect over the years, beginning with charity work with Playground Games, and we look forward to working with this amazing team for years to come." In previous years July has typically a fairly quiet month for news about the next Forza game, as weekly car reveals begin but we wait for new info about features to come with gamescom in August. These are potential news dates, edited with links as they are announced. Be sure to follow www.twitter.com/Forzamotorsport and read each Friday's Week in Review article on this site and in the Forza Hub for any updates. See also www.bit.ly/ForzaCalendars (unofficial) and the News tab on my www.bit.ly/FH4spreadsheets for a list of all related videos and articles to date. 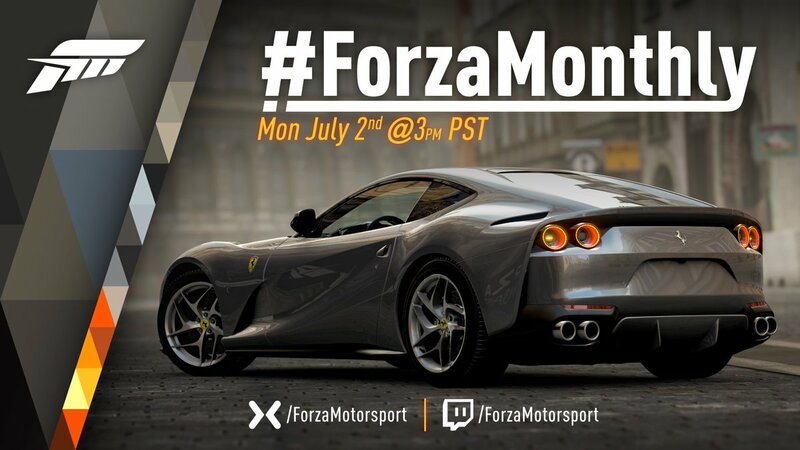 "The next episode of “Forza Monthly” will be broadcast on Monday, July 2, starting at 3 p.m. Pacific. ... we’ll be playing Forza Horizon 4 and answering viewer questions about Playground’s latest masterpiece"^ on mixer.com/Forzamotorsport. Friday's Forza Week in Review will recap Monday's show. Forza Garage weekly car reveals begin? In 2017, FM7 reveals began (with new screenshots) on Monday, July 17th. In 2016, cnet.com revealed a list of 150 FH3 cars on July 19 along with an article Just how tough is it to get a car scanned into Forza? interview with Brian Ekberg. Car reveals typically continue for six weeks through the end of August. Edinburgh is the large city on the map. The city and other map details will be revealed later. Britain has a variety of terrain, including mountains and more driftable roads. The weekly seasonal change "will happen quickly" in game. Every car will come with the dashboard camera view seen in the E3 demo. Bunnies and sheep can't be touched. Stacked stone walls can be smashed, while the few masonry walls are solid. The difference between smashable and solid trees will be visibly obvious. Double the number of tire compounds and new suspension geometry not in FH3, and rebalanced PI on the low end, provide more sense of contact with the road and difference between off-road and road vehicles. New Drift suspension option "for most cars in the game" goes lower, gives faster lock-to-lock, and up to 50 degrees of steering angle. Drag tire compound added to Horizon for the first time. Muscle cars may get drag-style suspension after launch. Big drag strip at the Festival. Major recalculation to Force Feedback on wheels for better realism. Body kits are continuing to be added to more cars. Buying houses with CR unlock Perks (TBA), and serve all the functions of a Festival site: fast travel, Forzavista, paint, and upgrades. Forzavista is now in your driveway to allow painting in natural light. 2 cars from the Formula Drift Car Pack revealed. More news on the car list later in the summer. No announcement on a Demo date yet. Inside Xbox returns to the spotlight live on Tuesday, July 10 at 3 p.m. ET/12:00 p.m. PT on Mixer, Twitch, YouTube, Facebook, and Twitter with interviews for Forza Horizon 4, We Happy Few, Earthfall, the latest news on Xbox Game Pass and a special story born from the Xbox Live Creators Program you won’t want to miss. Of course, we’ll also have a couple of secrets under wraps, and ready to reveal during the show as well. Forza Horizon 4: Ralph Fulton from Playground Games will be on-hand to reveal more about Seasons in Forza Horizon 4, but better yet, Inside Xbox will transition to a special hour-plus long broadcast from Playground Games in the UK, where the team will reveal never-before-seen gameplay for the Summer Season in FH4. www.mixer.com/Xbox from Noon Pacific to about 1:30 pm? www.mixer.com/Forzamotorsport from 1:30 pm to 3:00 pm? Highlights below, be sure to read the full article. "That will be followed by a video put together by Playground Games featuring Studio Director Ralph Fulton. It’s the first in a series of shows that will run on Tuesdays at this time in July. This first show will focus on the summer season and you can bet it will be full of details that you can only get here." The summer of Forza Horizon 4 is here and, this week, we kicked things off with a livestream dedicated to (what else?) SUMMER in Forza Horizon 4! This week we debuted the first in a series of livestreams from Playground Games’ HQ, showcasing each of the four seasons in Forza Horizon 4. If you missed the show, you missed a ton of news about the game. Fear not, though because the Week in Review has got you covered! In the hour-long stream, which was preceded by the July episode of Inside Xbox, Ralph Fulton, Ben Penrose, and others from the Playground Games team took viewers through a high-speed journey around summer in the Britain of Forza Horizon 4. First things first: summer is gorgeous. The team at Playground have gone to huge lengths to render the gorgeous summers in the game – creating a Britain that is lush and green and a joy to behold. Warm temperatures and clear skies also make for an ideal driving experience – in fact, the dry conditions mean that some rivers will dry up completely in the summer, which will certainly influence races and challenges in the game. Also during the show, we got a look at the variety of customization options in Forza Horizon 4. Players will be able to not just customize their cars with new body kits (30 in total) from makers like Liberty Walk and Rocket Bunny, but there will be new drift steering upgrades that will give drivers increased steering angles, as well as wheel spacers options for players who want to stance their cars just right. There was so much more to see and hear about during the show – including details on the 12 available houses players will be able to purchase, news on the airport and multiple drag strips, bonus boards, and so much more. And best of all, we’re just getting started! In our upcoming shows, we’ll dive deeper into the game, showing off new seasons and more features. On Tuesday, July 17, tune in to the next Playground livestream for a look at autumn at the Horizon Festival. The temperatures will be lower, the leaves will be changing colors, and the action on (and off!) the asphalt will be as fast and furious as ever. The show begins at 11 a.m. Pacific on the official Forza Mixer, Twitch, and YouTube channels – don’t miss it live! Seasons Change Everything livestream at 11am Pacific (7pm London) on www.mixer.com/Forzamotorsport, Twitch and YouTube. This week will highlight the Autumn season.^ The Summer stream on July 10 also mentioned that we'd see the map this week. #ThursdayThingo livestream with Johniwanna at 10am Pacific on www.mixer.com/Forzamotorsport - Don't expect new FH4 announcements from this stream, but John typically plays FH3 with viewers. #ForzaFriday livestream at 3pm Pacific on www.mixer.com/Forzamotorsport - Forza's weekly stream is typically focused on Forza Motorsport 7, but there may be mention FH4 news highlights to date. In previous years, The Forza Garage weekly car roster reveals began five weeks after E3, which would fall this week. The first one is often revealed by a third party outlet (CNET, Autoblog etc) followed by the official reveal on www.forzamotorsport.com/News the next day. There's no advance notice about the first reveal, so be sure to watch the Tuesday stream for any car reveal info, and especially news channels through Wednesday. Comic-Con takes place from July 16-22 in San Diego. Xbox usually has a presence there, allowing fans to try out upcoming game demos. In this case that would be the demo made available to E3 attendees. Microsoft/Xbox is listed as an exhibitor. Last year Xbox Wire published their overview a day before the event start, so look for that from Monday-Wednesday this week as well. "In this week’s “Seasons Change Everything” Forza Horizon 4 livestream from Playground Games in the UK, we got to see FH4 in all its autumnal glory. Better yet, we got to hear from the team directly, who showed off a ton of new content and tidbits on the game, including a first look at the FH4 map itself!" "We’ll be back with another stream next week and, yes, Winter is Coming. Look for the winter stream airing on Tuesday, beginning at 11 a.m. Pacific on our Forza and Mixer channels." In previous years, The Forza Garage weekly car roster reveals began five weeks after E3, which would have been last week. However, weekly livestreams in July is a new pattern, so car reveals may be done differently this time. - Wintertime in the UK of Forza Horizon 4 isn’t a one-size fits all season. Depending on where you are on the map, weather conditions, including snow level, the amount of ice, and more. will vary. For example, head up to the higher elevations of the Scottish Highlands and you’re bound to see more snow than if you’re cruising around in the lower areas of the map. - Related, even in winter, there will be locations that don’t have snow. This was an intentional choice, according to Playground’s Ralph Fulton, who said the team realized that snow on every road in the game would be disappointing for those who want to hop in a supercar and hoon around without having to worry about the weather conditions on the road. - Seasons change at the same time for everyone globally. Those playing the game during this transition will first see a countdown clock, ticking down to the change, then see a brief cinematic showing the season change before being deposited back in the world with the new season. - The map! We showed off the wintered-out version of the FH4 map, which you can see for yourself on the stream or in this Tweet. - Car Mastery – Every vehicle in Forza Horizon 4 now has a skill tree where you can unlock specific car bonuses. You earn points by performing skills in the game, then spend those points to unlock Car Mastery skills per vehicle. - Car Mastery skills can increase the amount of influence you earn in a race, increase the number of collisions it takes to break a skill chain while driving, and more. Best of all, a vehicle’s skill tree is based on the kind of car and what it’s meant to do. - #Forzathons have changed in Forza Horizon 4. Now there’s a #Forzathon Shop where you can spend #Forzathon points you earn from daily and weekly challenges on things like character customization items, legendary car horns, Forza Edition cars, and more. In addition to all that, the show gave fans a peek into the Forza Horizon 4 user interface, as well as a sneak peek at some of the trickier bonus board locations in the world. Don’t miss the fourth and final edition of “Seasons Change Everything” this coming Tuesday with a look at the fourth and final season: Spring! In addition to some good and muddy spring showers, look for the team to show off the city of Edinburgh for the first time, as well as a look at Team Racing features, and more. Seasons Change Everything livestream at 11am Pacific (7pm London) on www.mixer.com/Forzamotorsport, Twitch and YouTube. This week Playground's developers will will highlight the Spring season. In previous years, The Forza Garage weekly car roster reveals began in mid July. However, weekly livestreams in July is a new pattern, so car reveals may be done differently this time. ChinaJoy - the largest gaming expo in Asia - opens this coming weekend. 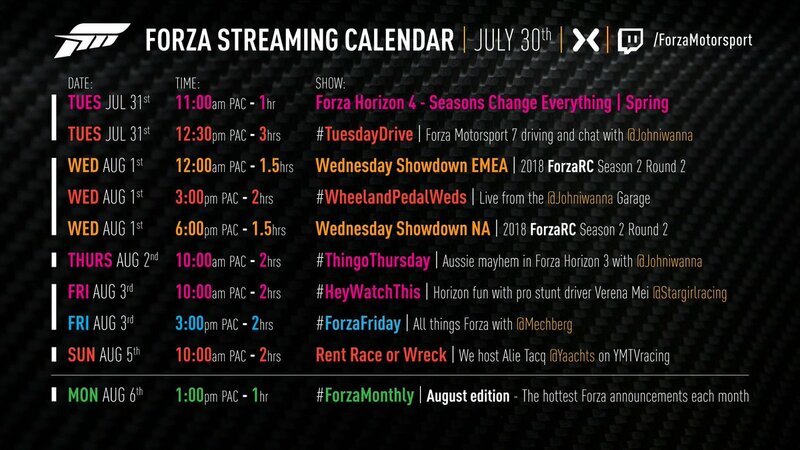 "Check out our Forza streaming schedule for the week of July 30, starting with tomorrow's #ForzaHorizon4 stream from @WeArePlayground!" "Join us tomorrow, Tuesday 31st July, at 19:00 BST / 11:00 PST for our fourth #ForzaHorizon4 live stream. This week focuses on Spring with a visit to Edinburgh, more gameplay and developer interviews. Watch on Forza channels on @WatchMixer / @Twitch / @YouTube ." "Buckle up and get ready to put the pedal to the metal – the Official "Forza News" Club is now available to check out on #Xbox. Hope you can join us!" 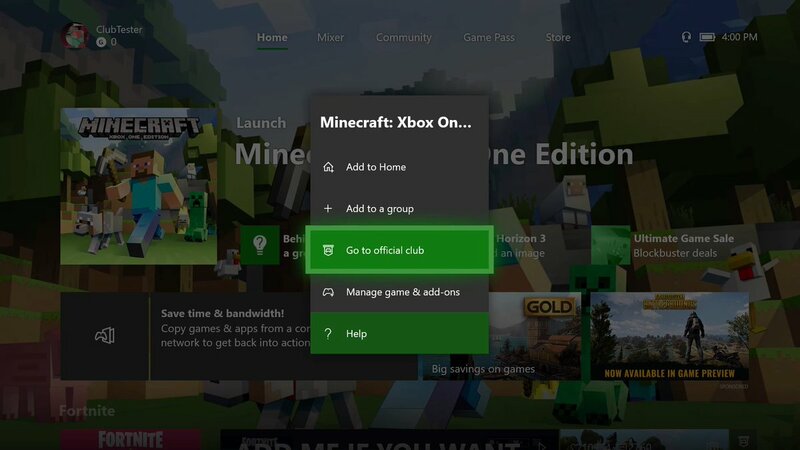 "Want to stay up to date with your favorite games & developers on #Xbox? Check out the all-new Official Clubs, available today for select titles. They'll have an official badge & placement within the Xbox Guide and menus." Before we dive into a recap of this week’s Forza action, I wanted to look ahead to the next episode of our “Forza Monthly” streaming series, which airs on Monday, August 6 beginning at 1 p.m. Pacific. Hot on the heels of Playground Games’ “Seasons Change Everything” series, we’ll be dipping back into the world of Forza Horizon 4 and showing off some cool new stuff that hasn’t been seen before. In addition, we’ll be breaking down the August update for Forza Motorsport 7 in all sorts of detail. Along the way we’ll have special guests and an in-studio car that you’re going to love. If you’re a Forza fan, make sure you clear your calendars and tune in on the official Forza Motorsport Twitch and Mixer channels for the big show! - Spring time is beautiful in Forza Horizon 4. We started the show in the north end of the Lake District and everything looked radically different from the week prior. Sure, the lack of snow was a big differentiator from winter but there was more to it. The world felt like it had come back to life, with colorful plant life everywhere, leaves returning to the trees… even the lighting felt different. In fact, according to Playground, the days will be longer in spring time, and there is more brightness to the environment that reflects the glory of the season. - While we didn’t get a full rundown of songs coming to Forza Horizon 4, we do know the list of confirmed radio stations and DJs that will entertain you as you drive: Block Party, Bass Arena, Pulse, XS, Timeless are in and Hospital Records will have another drum & bass-dedicated channel, featuring brand new music that you’ll hear for the first time in the game. 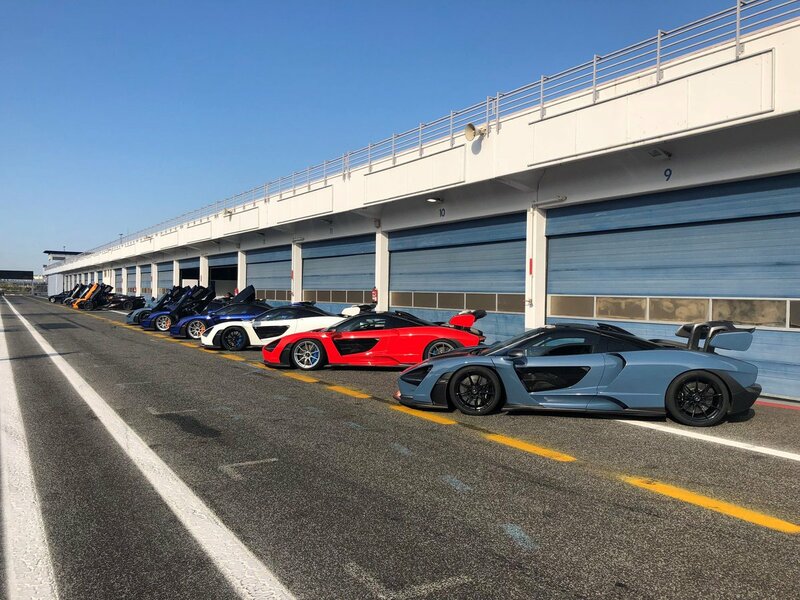 - Speaking of sounds, we got to hear from senior audio designer Fraser Strachan, who talked about capturing audio of the vehicles in the game, including the McLaren Senna which, from the looks of the video, was recorded at the Top Gear Test Track in Dunsfold. - In addition to seeing Team Racing in Forza Horizon 4 for the first time, we saw a new team mode called Survival. Think of this as a team version of the popular Infected game from previous Forza Horizon games. It’s fast, it’s hectic, and the team aspect brings a whole new layer of depth to Horizon’s playground game events. - Last but certainly not least was the city of Edinburgh. Revealed in the most dramatic possible fashion (via a huge jump that overlooks the city), the Edinburgh of Forza Horizon 4 joins cities like Surfers Paradise and Nice in the line of amazing urban locales to enjoy and explore in the Horizon series. If you’re familiar with Scotland’s capital, you’ll immediately recognize landmarks like the Scott Monument and Princess Street. What makes the city so fascinating from a driving standpoint is its age. The streets of Edinburgh are twisting and turning, far from the grid layout of modern cities. As a result, from the looks of things, there could be surprises around every corner. While it’s sad to see the “Seasons Change Everything” series wrap up, there’s still more Forza Horizon 4 news to come this summer. In addition to the game’s appearance on this Monday’s “Forza Monthly” show, you can expect to see the game, along with more news, at Gamescom later this month. Forza Monthly livestream at 1pm Pacific (9pm London) on www.mixer.com/Forzamotorsport, Twitch and YouTube with new unseen FH4 details. On Monday we aired our August episode of “Forza Monthly” and, in addition to spending a great deal of the show outlining the awesomeness of the August update for Forza 7, we also revealed the full list of cars that are part of the Formula D Car Pack. As a reminder, the Formula Drift Car Pack is available to players who digitally pre-order Forza Horizon 4, and the cars will be delivered in both Horizon 4 (at launch) and Forza Motorsport 7 (this fall). If you can’t get enough of the Formula D Car Pack, make sure you tune into this weekend’s Formula Drift event from St. Louis at formulad.com/live. We’ll be debuting the trailer for the Formula Drift Car Pack during Saturday’s halftime show broadcast, which will start approximately at 2:30 p.m. Pacific. "Forza Horizon 4 brings a host of new features including dynamic seasons, a shared world, new gameplay modes, player houses, new showcase events, and so much more! This highlight video recaps just a sliver of the over 4 hours of Forza Horizon 4 gameplay streaming hosted by Plaground Games. Head to Forzamotorsport.net for the full live stream VOD."